We also assessed differences between buying behaviors of younger and older business owners so asked about age. 52% of respondents are 55 or older and 48% are 54 or younger. 29% look to the company’s website. While most business owners place a premium on the value of their website, there is opportunity for many businesses to increase the quality of their website; and in many cases, the content is dated and should be updated. 46% of owners look to other business owners using the product or service to have the greatest influence on their buying decision. This is becoming even more importance since 52% of owners aged 25- 54 chose this option compared to 41% of owners 55 and older. Vendors should place a premium on developing an enthusiastic group of references that prospects can speak to. 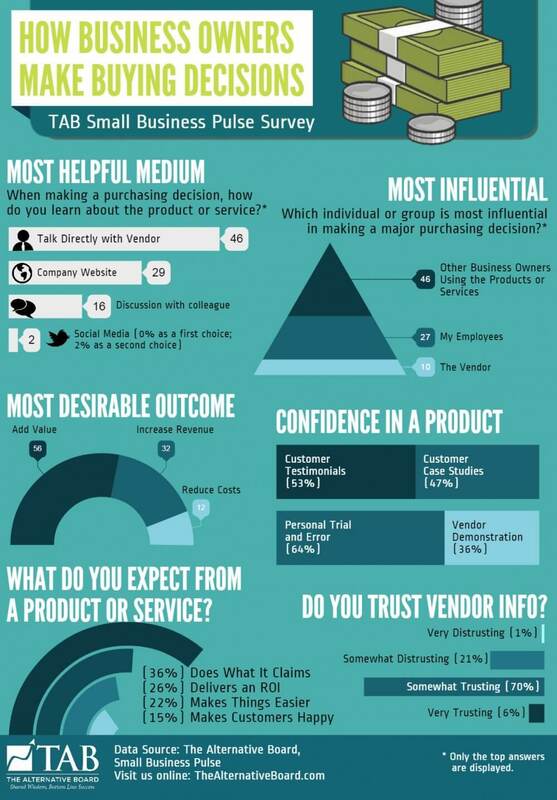 Vendor information that is relevant (49%), informative (40%) and independent (9%) is received most positively. What is the most important way for a new vendor to initiative contact with you? Only 3% responded with request a connection via Social Media. Importantly, 5% of respondents in age group 25-54 responded positively and 0% of 55+ owners. between $1 million and $5 million. about age. 52% of respondents are 55 or older and 48% are 54 or younger. representatives, the company’s website and conversation with a colleague. Other business owners is by far the greatest single source in influencing the buying decisions. Employees are the second most important source of influence. revenue is second and is nearly three times as important as reducing cost. 36% selecting demonstration by the vendor. receive the benefit of the doubt initially. contacted at all. It is therefore important for vendors to make it easy for their prospects to find them. cases, the content is dated and should be updated. engagement and less for product and service education. developing an enthusiastic group of references that prospects can speak to. seem to be in decline as younger business owners look to them less. to others to influence their buying decisions. and case studies. Video testimonials are much more effective than written testimonials. personal trial & error than older business owners (59%). designing new products or services. benefit of the doubt. It is up to them to maintain that trust throughout the buying lifecycle. insufficient in detail (21%), over technical (10%) and repetitive (8%). opportunity for owners to discover them. group 25-54 responded positively and 0% of 55+ owners.